After their parents divorced in the 1970s, Andre Dubus III and his three siblings grew up with their exhausted working mother in a depressed Massachusetts mill town saturated with drugs and crime. To protect himself and those he loved from street violence, Andre learned to use his fists so well that he was even scared of himself. He was on a fast track to getting killed--or killing someone else. He signed on as a boxer. Nearby, his father, an eminent author, taught on a college campus and took the kids out on Sundays. The clash of worlds couldn't have been more stark--or more difficult for a son to communicate to a father. Only by becoming a writer himself could Andre begin to bridge the abyss and save himself. His memoir is a riveting, visceral, profound meditation on physical violence and the failures and triumphs of love. Townie, Finalist, 2012 Indie's Choice "Book of the Year for Adult Non-fiction"
"Long before he became the highly acclaimed author of House of Sand and Fog, Dubus shuffled and punched his way through a childhood and youth full of dysfunction, desperation, and determination. Just after he turned 12, Dubus's family fell rapidly into shambles after his father--the prominent writer Andre Dubus--not only left his wife for a younger woman but also left the family in distressing poverty on the violent and drug infested side of their Massachusetts mill town. For a few years, Dubus escaped into drugs, embracing the apathetic "no-way-out" attitude of his friends. After having his bike stolen, being slapped around by some of the town's bullies, and watching his brother and mother humiliated by some of the town's thugs, Dubus started lifting weights at home and boxing at the local gym. Modeling himself on the Walking Tall sheriff, Buford Pusser, Dubus paid back acts of physical violence. Ultimately, he decided to take up his pen and write his way up from the bottom and into a new relationship with his father. In this gritty and gripping memoir, Dubus bares his soul in stunning and page-turning prose." "A powerful, haunting memoir from acclaimed novelist Dubus III.The author grew up poor in Massachusetts mill towns, the oldest of four children of the celebrated short-story writer Andre Dubus (1936–1999), who abandoned the family in 1968 to pursue a young student. Beautifully written and bursting with life, the book tells the story of a boy struggling to express his “hurt and rage,” first through violence aimed at school and barroom bullies and ultimately through the power of words. Weak and shy as he entered his teens, Dubus III lived with his mother and siblings in run-down houses in crime-ridden neighborhoods, where they ate canned food for dinner and considered occasional “mystery” car rides to nowhere special with their mother a big treat. While his mother was at work, young toughs hung out at his house doing drugs. At 16, he began training with weights and grew strong to fight his tormenters, and he became a vicious brawler in a leather jacket and ponytail. Meanwhile, at nearby Bradford College , his father taught, striding across campus in his neatly trimmed beard and Australian cowboy hats. The elder Dubus sent money home and took the children out on Sundays, but otherwise remained out of touch. He eventually went through many young women and three broken marriages. At Bradford , which he entered as a student, Dubus III was known only as his father’s son, “such a townie.” Although the author stopped expecting anything from his father, he yearned for the connection that finally came years later when he helped care for the elder Dubus after the 1986 car accident that crushed his legs. By then, Dubus III had found a new way to draw on the anger of the “semi-abandoned,” turning his punches into sentences. His compassionate memoir abounds with exquisitely rendered scenes of fighting, cheating, drugging, drinking and loving. A striking, eloquent account of growing up poor and of the making of a writer." "Townie is a resolute story about the forging of a writer in fire and blood and a wrenching journey through the wreckage of New England’s lost factory world during the Vietnam War era. But Dubus wasn’t born into poverty, rage, and violence. His father, an ex–marine officer turned celebrated writer and adored college professor, initially settled his first family in the bucolic countryside. But the marriage failed, “Pop” moved out, and the four kids and their overwhelmed mother plunged into impoverished small-town hell. Dubus, a target for bullies, and his equally complex and resilient siblings were hungry, neglected, and imperiled within a storm of druggy nihilism and bloodlust. Dubus survived by lifting weights and learning to fight, but his unbridled aggression, even on the side of good, exacted a spiritual toll. Although their charismatic father was oblivious to his children’s suffering, he was not unloving, and when an accident left him confined to a wheelchair, their support was profound. Dubus chronicles each traumatic incident and realization in stabbing detail. So chiseled are his dramatic memories, his shocking yet redemptive memoir of self-transformation feels like testimony under oath as well as hard-hammered therapy, coalescing, ultimately, in a generous, penetrating, and cathartic dissection of misery and fury, creativity and forgiveness, responsibility and compassion." "Compelling, riveting, gritty and astonishingly moving, Dubus's memoir, Townie, achieves that rarest of qualities: It makes us love the boy who becomes the man." "I've never read a better or more serious meditation on violence, its sources, consequences, and, especially, its terrifying pleasures than Townie. It's a brutal and, yes, thrilling memoir that sheds real light on the creative process of two of our best writers, Andre Dubus III and his famous, much revered father. You'll never read the work of either man in quite the same way afterward. You may not view the world in quite the same way either." "Every bit as riveting as Jeannette Walls's The Glass Castle, Andre Dubus III's coming of age memoir, Townie, investigates another side of the brink-of-poverty childhood--namely, the side ruled by testosterone, rage, and fear. After young Andre's writer father packs up and leaves his family to the rough and tumble neighborhoods of a decaying New England mill town, his son is faced with an uncomfortable decision: to flee the bullies who rule the streets of his world or fight them. In visceral and moving detail, Dubus describes how he exchanges his fear for fisticuffs and later unclenches those fists as he comes to understand the power of words and forgiveness. Whatever it cost Dubus to bare his soul and write this brutally honest and life-affirming memoir, it is an extraordinary gift to his readers--those in the fold already and the new ones that Townie will no doubt attract." "This is a wonderful book, the best first-person account of an author's life I have ever read. I think it's better than Joyce's Portrait of the Artist as a Young Man, better than Ernest Hemingway's accounts of his early life, and in fact better than any memoir I have ever read. Maybe its greatness as a book lies in the fact the author, Andre Dubus, III, becomes in his way the voice of Everyman out of the Medieval morality plays. The story is one of courage and endurance and ultimately spiritual salvation and reconciliation. I think the founders of early Christianity would recognize every figure among the cast of characters. The story is a universal one and it doesn't judge or proselytize; it simply presents people as they were or as they are. It also gives an insight into what Michael Herrington called "the other America," a shadow society we don't recognize but from which much of our national dynamic is derived. It's a violent book in many ways, but the violence that is described is the kind that is with us every day, whether we recognize it or not. The characters are wonderful and compassionately drawn, even the thugs prowling the streets of greater Boston's underworld. No one who reads this book will ever forget it." 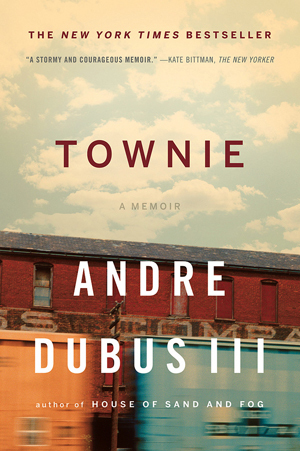 "In his powerful memoir, Townie, Andre Dubus III explores the complicated and intense relationships between siblings, mothers and sons, and fathers and sons. He takes us through his idyllic early years as the son of a writer in various small college towns, into the murky waters of divorce and its aftermath. Growing up in hardscrabble old mill towns, Dubus learned to fight and survive and ultimately to find his own glorious voice. Townie celebrates that voice as Dubus finds his redemptive place in the world at last." Keep up to date on Andre's new books and more!